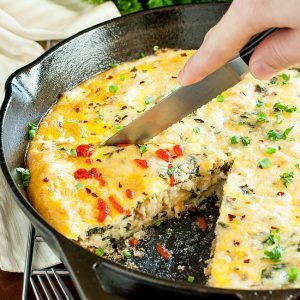 Swirled with spinach and topped with fresh herbs, this skillet sausage, egg, and cheese grits breakfast bake will delight your friends and family! And even better? This brunch bombshell of a breakfast casserole can be made in advance! If you’ve frequented this blog a bit then you know all about my affinity for breakfast foods. We breakfast, brunch, and brinner our faces off! Since discovering the chickpea shares our obsession with all things brekkie we are almost single-handedly keeping eggs in business over here. We now have to pick up two dozen each grocery run for fear of running out. Even then we still occasionally run out. Now that this dish is in our lives? We’re totally running out! TASTY TOPPINGS: add your favorites! Thaw spinach + squeeze out liquid with paper towels. In a small-medium pot, bring broth to a rolling boil. Stir in grits, salt, and half and half and reduce heat to low/simmer. Cook grits for 12-15 minutes, stirring occasionally until thickened. While the grits cook, brown sausage in a large cast iron skillet over medium-high heat, stirring often, 5-8 minutes or until sausage crumbles and is fully cooked; remove from skillet, and drain. Add your sausage to the grits then gently fold in the eggs until blended. With either olive or coconut oil, grease a 10-12-inch cast iron skillet then sprinkle the bottom and sides with cornmeal. Add your breakfast mixture then sprinkle with remaining Cheddar cheese and top with a light sprinkling of red pepper flakes. Bake at 350° for 55 minutes or until set. Remove from oven and transfer to a wire rack to cool for approx. 30 minutes. Top with fresh parsley and green onion [optional but delish garnishes for a burst of color!] and top with your favorite hot sauce. Enjoy! Have half and half handy? Awesome! If not you can make your own by combining 1/2 cup cream with 1/2 cup milk. You can also use 1 cup of heavy cream instead if you'd like. For the cheese, feel free to use a combination of any cheeses you have on hand! My default is white cheddar and gouda but a number of cheeses would compliment the flavor of this dish! Freshly grated is best flavor-wise but in a pinch you can totally use pre-shredded cheese. To Freeze: Prepare recipe as directed through Step 5 in a foil baking dish. Cover tightly with plastic wrap and heavy-duty aluminum foil. Freeze up to 1 month. Thaw in refrigerator 24 hours. Let stand at room temperature 30 minutes, and bake as directed.Feeding a crowd? Recipe may be doubled and baked in a 13-inch x 9-inch baking dish for 1 hour. 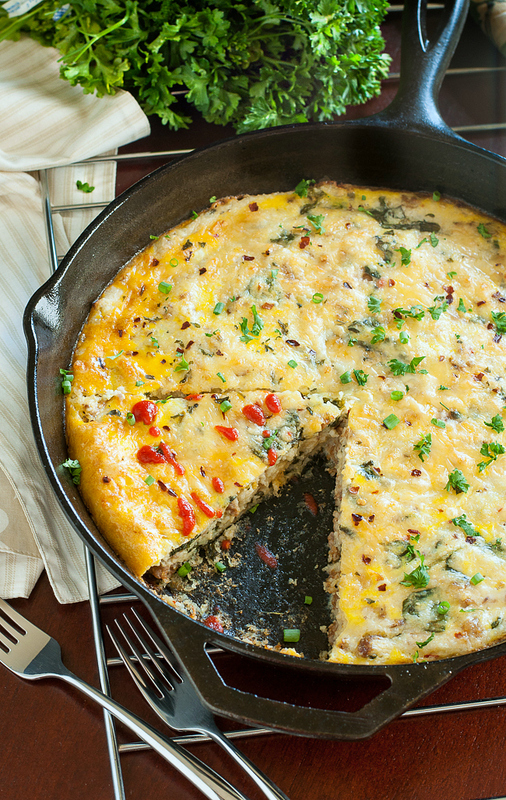 There’s something awesome about tucking a bevvy of breakfast foods into a quiche-like package. 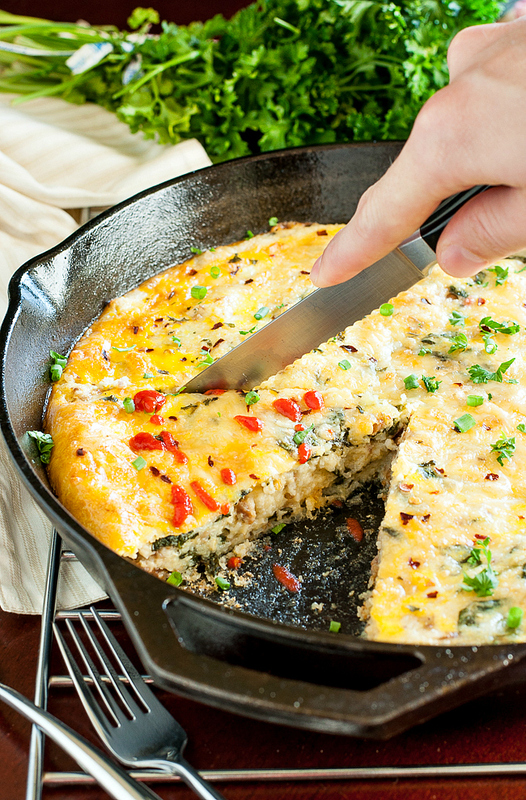 Each bite is as delicious as the last; I’m in love with this sassy brunch-in-a-skillet! The only thing I love more is that I have leftovers for breakfast tomorrow! Cue confetti and obnoxious dancing. I have a feeling this easy peasy dish is going to be on serious repeat around here. If you get a chance to try this Skillet Sausage, Egg, and Cheese Grits Breakfast Bake, let me know! You can leave me a comment here (LOVE checking those daily!) or tag @PEASandCRAYONS on Instagram so I can happy dance over your creations. I can’t wait to see what you whip up! Hi Carolyn! The broth/stock is used to cook the grits in step 3 and will be absorbed into the grits. I’m not sure how the spinach snuck away in the directions there but I’ve fixed it now, thank you! I add it in step 7 along with the sausage. I made this for Christmas brunch and got rave reviews- will totally make again. It’s good served w avocado!! Merry Christmas! When are you supposed to add the spinach after its been thawed? Just found this recipe. It looks delicious. But I’m confused about the make ahead instructions. It says through step 5. Does that mean you don’t add the cheese, sausage and egg until just before cooking (after it’s thawed)? In other words, the grits is all you do beforehand? Or was it supposed to say through Step 7 or 8? Thanks for the help. I’m hoping to make this this weekend for a large group and would appreciate the clarification. If you’re making it the night before and popping it in the fridge, don’t worry about the freezer-safe bit. Add to a greased baking dish and don’t add the extra cheese on top quite yet. Store covered with foil in the fridge until you’re ready to bake in the morning 🙂 Before baking, add the remaining cheese on top plus any extra to taste. You can bring the casserole to room temp to cut down on bake time or put it straight in. (you’ll need to add extra time if it goes in cold) I hope you and your guests adore it Shelly, thanks again! Actually now that I’m thinking of it, I wonder if it would save even more bake time to partially bake it the night before so and finish it off in the oven the next morning? I might need to try that out this week and see how it goes! Aw thanks so much Kathryn! <3 You always make my day! This breakfast skillet looks great. I love that it is quiche like and make ahead! Thanks Kathy!!! The leftovers are really really good too!